Which is best? Running outside or inside? A lot of my clients ask me wherever I prefer to run inside or outside and the answer is simple, outside. Outdoor running potentially burns more calories because the body reacts to meet the demands brought on by the drop in temperature. So the body is trying to keep cool while being pushed to its limits. As well as this, running outside on different terrains dictates certain speeds therefore could make you burn more calories and not only that, it’s more natural and gives you a real sense of achievement! Getting a head start indoors can be just as beneficial. Yes, you are stuck watching the same four walls but, generally treadmills are surrounded by a lot of equipment. More equipment means you have a larger variety of activities to choose from and best of all, you can cross-train! So what does this mean for me…? I believe there are generally more benefits from running outside however there are more variables that affect our running. So if you enjoy walking outdoors and want to get a variety of terrains under your belt, then outdoor running is defiantly for you! 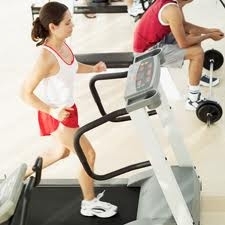 If you do like the fact of using a treadmill or simply the atmosphere that a gym can create, then stay inside. Practically indoors is better because of the more options you have access too. Of course, your personal trainer can work with you either outside or inside, so that shouldn’t matter either. However, if the current weather is just to wet and cold for you to take on outside running, then there is no harm in keep fit inside a warm – and dry – gym.